Superstar Shah Rukh Khan is ringing in his 53rd birthday today and the celebrations have already started for the Badshah as at the stroke of midnight, he rang in his birthday with his family and fans at his palatial home in Bandra. Yes, SRK rang in his birthday with wife Gauri Khan, Zoya Akhtar, Karan Johar and other close friends. Karan Johar shared a sweet photo of Shah Rukh and Gauri Khan as they cut his birthday cake. Not many know that the ‘Raees‘ star’s cake has a Bauua Singh connection. The cake has a mini Bauua Singh, the character SRK is depicting in his upcoming release ‘Zero’. 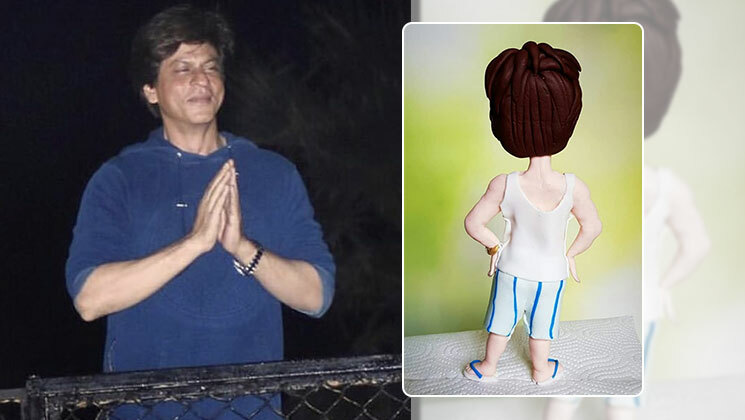 Apparently, this cake was gifted to SRK’s by one of his fan clubs and it had the mini character dressed in a white vest with blue and white striped shorts on top of it. And this is how the top tier of our HUMONGOUS cake is gonna be. Any guesses who's he? P.S. : Woh aaraha hai!! Shah Rukh Khan even stepped out to greet his fans who had come to Mumbai from distant places to wish him on his birthday. The actor even distributed merchandise of his upcoming film, ‘Zero’. Today is a double celebration for SRK fans, as it is not only King Khan’s birthday but the trailer of his most awaited release ‘Zero’ will be unveiled by the makers. The Aanand L Rai directorial has Katrina Kaif playing the role of a diva who is an alcoholic, whereas Anushka Sharma will be seen essaying the role of a scientist in the film. ‘Zero’ is all set to release on 21 December 2018.